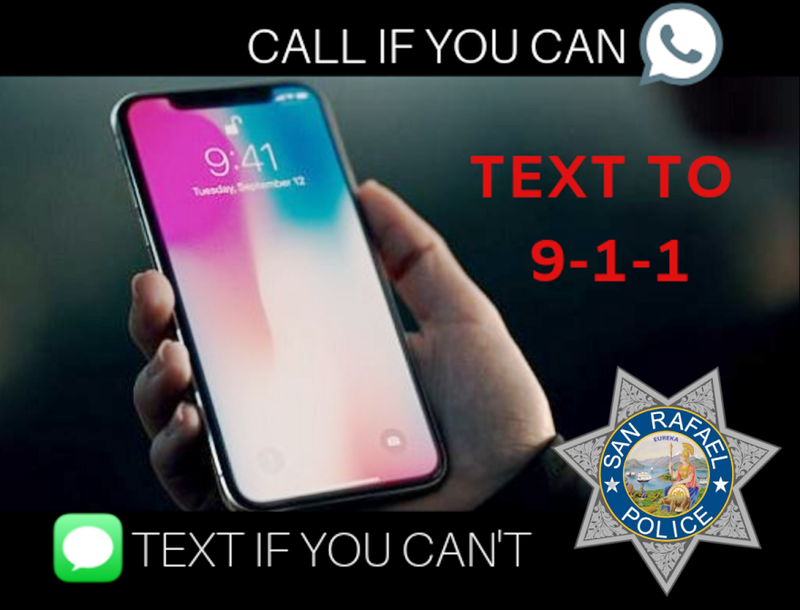 The San Rafael Police Department, in conjunction with the Fairfax Police Department and Novato Police Department’s dispatch centers, is excited to announce that we now have the ability to accept text-to-911 service throughout our jurisdictions. CHP – Marin also accepts text-to-911. The Marin County Sheriff’s Office should begin accepting text-to-911 calls in June 2019. Wireless customers can now send a text message to 911 in an emergency. It is important to note that text-to-911 should only be used in an emergency when placing a call is not possible. For example, if the caller is hearing impaired, speech impaired, or if speaking out loud would put the caller in danger, text to-911 would be appropriate. Do not use slang, abbreviations or emojis. Be prepared to answer questions and follow instructions. Do not send pictures, videos or other types of media. If text-to-911 is not available, you will receive a bounce back message; You must call 911 to receive assistance. For more information, call the San Rafael Police Department at (415) 485-3000.